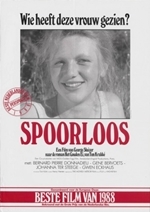 The Vanishing (Dutch: Spoorloos, literally "Traceless" or "Without a Trace") is a Dutch-French film adaptation of the novella The Golden Egg by Tim Krabbe, released on 27 October 1988. Directed by George Sluizer and starring Bernard-Pierre Donnadieu, the film is about the disappearance of a young Dutch woman and her lover's obsessive search for her, which leads him into increasingly dangerous territory. In France the film was released under the title L'homme qui voulait savoir (The Man Who Wanted to Know). On the film's American release in 1990, The Vanishing received great critical acclaim. Sluizer later remade the film for an English version in 1993, but the remake was poorly received. Stanley Kubrick thought The Vanishing was the most terrifying film he had seen-even more frightening than The Shining, leading Kubrick to call Sluizer to discuss editing.